The Olympus Six (オリンパス・シックス) is a dual-format folding camera, taking 6×6cm and 4.5×6cm pictures, released in 1940 by Takachiho (later Olympus). It was the successor of the Semi Olympus II and was followed by the Olympus Chrome Six in 1948. The Olympus Six is a horizontal folder, and its folding struts are inspired by the Balda products, the same as that of the Semi Olympus II. The body has a mixed diecast and pressed steel construction. There is a folding optical finder in the middle of the top plate. Two hairlines are engraved in the front glass, indicating the field of view for 4.5×6cm exposures. The folding bed release is immediately to the left of the viewfinder, as seen by the photographer. There is a body release at the right of the top plate, next to the right-hand film flange. The advance knob is at the left end, and the body serial number and an arrow are engraved at the top, as on the Semi Olympus II. There are strap lugs at both ends of the top plate, replacing the leather handle of the previous model, and there is no accessory shoe. The back is hinged to the right, and the back latch consists of a long sliding bar. There are two red windows in the back, one for each format, with a sliding cover accordingly marked 6X6 or 4.5X6. The bottom plate has two film flanges at the ends, and a 3/8″ tripod thread in the middle. The OLYMPUS TOKYO logo is embossed in the leather of the folding bed, and the name OLYMPUS–SIX or SUPER–OLYMPUS is embossed in the back, under the red windows. The first lenses mounted on the Olympus Six are the Zuiko 7.5cm f/4.5 (same as on the Semi Olympus and Semi Olympus II) and the new Zuiko 7.5cm f/3.5, both with four elements. The engraving on the lens rim is either Zuiko 1:4,5 f=7.5cm Takatiho Tokyo No.xxxx or Zuiko 1:3,5 f=7.5cm Takatiho Tokyo No.xxxx. The shutter originally mounted on the camera is a revised version of the Koho (1–200, B, T), adapted to the body release linkage. It still has a self-timer but does not have a thread for a distant release. The Koho shutters were made in the Hatagaya plant, whereas the bodies and lenses were made in the Shibuya plant. Other shutters were mounted after the war (see below). Whatever the shutter and lens model, the camera has a black depth-of-field scale around the lens, marked OLYMPUS at the bottom. The aperture scale consists of a metal plate placed above the shutter housing, and it is combined with a second scale of shutter speeds, readable from the above. The camera was first announced as the Semi Olympus III (セミオリンパスⅢ型), quite a strange name for a 6×6 camera. It was featured under that name in the July 1940 issue of Asahi Camera and was advertised as such in the June and July 1940 issues of the same magazine. In the June advertisement, the camera is announced as a new model (愈々新型発売) in dual format (6×6 and 4.5×6), and the body release and depth-of-field scale are emphasized. The shutter is mentioned as a Koho II (コーホーⅡ), giving 1–200, B, T speeds, with a self-timer. Two versions are presented, one has a Zuiko (ズイコー) 7.5cm f/4.5 lens and is priced at ¥190, the other has a Zuiko 7.5cm f/3.5 lens and is priced at ¥235. A lens hood is also listed for ¥3. The company names given in the advertisement are the manufacturer Takachiho Seisakusho and the distributor Ataka Shōkai. The pictured camera is indistinguishable from the Olympus Six with f/3.5 lens, there was probably no difference other than the name embossed on the back. No surviving example has been observed so far with markings other than OLYMPUS–SIX or SUPER–OLYMPUS, and the name Semi Olympus III was probably dropped before the camera entered serial production. The Olympus Six was first advertised under that name in the December 1940 issue of Asahi Camera, and was featured in the April 1941 issue of the same magazine. The advertisements dated December 1940 and April 1941 in Asahi Camera mention the f/3.5 and f/4.5 lens options, and say that the lenses have four elements. The shutter is called "New Koho III" (新コーホーⅢ) but it seems to be the same as the "Koho II" mentioned in the advertisement for the Semi Olympus III. The distributor is still Ataka Shōkai. The picture is the same in the two advertisements, and shows an Olympus Six with f/4.5 lens, recognized by the double lens rim already present on the Semi Olympus II. It is sometimes said that the the lens bezel and lens rim differ between the Semi Olympus III and the Olympus Six, but this apparent difference is only caused by the various lens types (f/3.5 and f/4.5) pictured in the advertisements. The April 1941 announcement in Asahi Camera, reproduced below, does not mention the ability to take 4.5×6cm pictures, and gives the shutter name as "Koho II". The price is quoted as ¥218 for the f/4.5 version and ¥160 with f/3.5 lens, but these were obviously swapped. A lens hood is mentioned at ¥3. An original brochure for the Olympus Six is reproduced in the official Olympus history page (archived). The two versions are listed, with their exact model name and officially set price: the Olympus Six I (オリンパス・シックスⅠ) with f/4.5 lens, for ¥128, and the Olympus Six II (オリンパス・シックスⅡ), with f/3.5 lens, for ¥160. A lens hood is mentioned, fitting both the f/4.5 and f/3.5 lens, and a filter holder (フィルター枠), to fit 30mm diameter filters on the f/4.5 lens. In the document, the shutter is called "Koho III". The Olympus Six I and II are mentioned in the official list of set prices compiled in October 1940 and published in January 1941. The prices are the same as in the brochure cited above, which is thus probably dated late 1940 or early 1941. 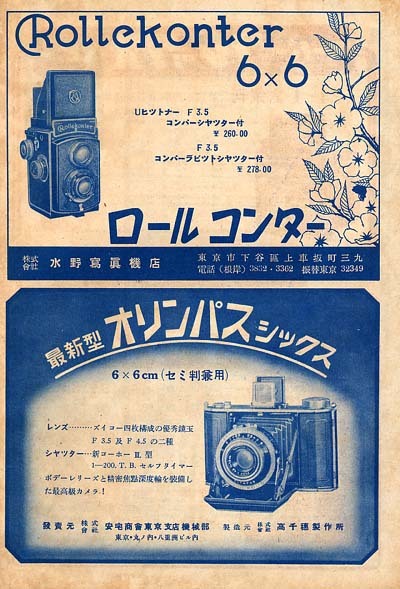 The Olympus Six was advertised in Asahi Camera until the last wartime issue of the magazine, dated April 1942, and it was advertised in Hōdō Shashin from December 1941 to May 1943. The shutter is reportedly called "Koho II" in the advertisements published in Hōdō Shashin, adding to the confusion on the exact shutter name. Some early examples have a peculiar aperture index with two ears, as visible in the brochure and in the advertisements. This part was gradually replaced by a simple pin-shaped index, as found on all later cameras. Super Olympus I no.12112, Koho shutter, Zuiko-S 7.5cm f/4.5 lens no.12507. The Super Olympus is a version of the Olympus Six with five-element Zuiko-S lenses. The Super Olympus I (スーパーオリンパスⅠ) has a 7.5cm f/4.5, and the Super Olympus II (スーパーオリンパスⅡ) has a 7.5cm f/3.5. The change in the lens design was caused by problems in the supply of lens glass. It is said that the imports of German Schott glass were stopped because of the war, and the company had to make its lenses from all-Japanese optical glass. The rear doublet of the Tessar scheme was replaced by a group of three cemented elements, certainly to cope with the limitations of domestic glass. The Super Olympus I and II appear in the April 1943 government inquiry listing Japanese camera production, along with the Olympus Six I and II. This document is the only one known to give model numbers for the Super Olympus; it makes a clear distinction between the Zuiko-S five-element lenses of the Super Olympus and the Zuiko four-element lenses of the Olympus Six. An advertisement for the Super Olympus was placed in the February 15, 1944 issue of Nihon Shashin Kōgyō Tsūshin. This document mentions the five-element lens. The camera is plainly called "Super Olympus" (スーパーオリンパス), with no mention of a model number. The price is given as ¥203 with an f/4.5 lens and ¥243.30 with an f/3.5 lens. Two company names are given: the manufacturer Takachiho Kōgaku Kōgyō and the distributor Ataka Sangyō. It is said that the company stopped camera production in 1943, and the Super Olympus are probably the last wartime Olympus cameras. Parts and toolings were stocked in the Suwa plant, a former textile factory in the prefecture of Nagano, used by the company as a dispersal plant from 1943. About 5,000 or 6,000 prewar and wartime Olympus Six and Super Olympus were made. Body numbers are known in the 7xxx to 12xxx range, and lens numbers from c.7000 to c.13500. An easy way to recognize them from postwar cameras is that their lens number is lower than 20000 (see below), and their lens and body numbers are closely matching, with a gap no wider than 1000 or so. The production of the camera was resumed in early 1946 in the Suwa plant. The Olympus official website shows a blueprint for the Olympus Six II, reportedly dated January 1946 and redrawn because the original ones were lost in the air raid which destroyed the Hatagaya plant. The lens marking reproduced in this blueprint shows a lens number legible as 7231 or 7251, corresponding to the very first f/3.5 lenses; this is probably because the designer worked from early pictures or from an early example held by the company. Monthly production figures are known for the first half of 1946: 77 cameras in January, 89 in February, 202 in March, 198 in April, 160 in May, 250 in June and 129 in July, for a total of 1,015 in seven months. It is not known for sure if these figures all correspond to newly produced Zuiko lenses or if they include some examples with spare Zuiko or Zuiko-S. The price of the Olympus Six was set at ¥2,350 in the first postwar official price list, published in July 1946. After World War II, the Zuiko f/3.5 four-element lens was recomputed for all-Japanese lens glass, and its production was rapidly resumed. It seems that the sequence of lens numbers was reset at 20000 or 20001, any higher number being an indication of a postwar lens. Immediately after the five-element Zuiko-S lenses no.12126, 12162, 12507 and 13501 mounted on wartime Super Olympus, the next numbers observed are 20016, 20224 and 20309, for regular Zuiko lenses, necessarily made after 1945. These are mounted on camera bodies in the 12xxx and 13xxx range; all have Koho shutters. At least two of these cameras (body no.12936 and 13414) have the name SUPER–OLYMPUS embossed on the back; all subsequent examples have OLYMPUS–SIX instead. It seems that the first lenses made after 1945 were mounted on spare camera bodies, complete with their leather covering and awaiting a lens and shutter unit, hence the markings identifying them as Super Olympus. OLYMPUS–SIX marking on the back, coarse-grained leather covering. At some point, it seems that the situation became difficult, and Takachiho bought wartime stocks from various other companies. On these older shutters, the name is inscribed on the front plate, as was common in the prewar era, and is hidden by the camera's depth-of-field scale. They can be identified by carefully removing the lens rim, then the black OLYMPUS ring. Postwar Olympus Six, "no-name" Sport shutter (1–300, B, T), Zuiko 7.5cm f/3.5 lens. The "no-name" shutter that was most commonly mounted in that period has 1–300, B, T speeds (in that order) and no self-timer. Its cocking lever is at the top right (as seen from the front) and travels on a short distance. It has been observed on at least eight different cameras, with lens numbers from 23714 to 25787, and 30402. Corresponding body numbers run from 14444 to 15927, except for one camera which has spurious no.11248, certainly because some older body shell was found in the stocks. Postwar Olympus Six, "no-name" Wester shutter (1–200, B, T), Zuiko 7.5cm f/3.5 lens. Disassembling sequence on body no.14922, revealing the Wester I shutter. Finally, a third type of "no-name" shutter has been observed on an isolated camera, with lens no.24961. It gives T, B, 1–250 speeds (in that order) and has a thread for a cable release; its cocking lever is at the top left (as seen from the front) and has a long travel, and it has a release lever at the bottom left, slightly overlapping the black OLYMPUS ring. It is not clear if the camera's body release mechanism is still functional. It is not known if that shutter type was actually used by Takachiho, or if the part was replaced on that particular camera. During that period, the company episodically found a few spare Koho, examples of which are known on body no.15013 and 17328, with lens no.25625 and 31665. The last examples of the Olympus Six have a Wester shutter (1–200, B, T) with self-timer, properly identified by the marking WESTER. N.S.D. at the bottom of the rim. It is plausible that these Wester N.S.D. were newly-built products supplied by Nishida, and were not taken from wartime stocks, but this is not confirmed for sure. Most of these shutters use a peculiar font for the speed settings, but at least one example has been observed with a more traditional font. The Olympus Six was advertised in Ars Camera from January to March 1948. The January advertisement mentions a Zuiko f/3.5 lens and a Koho shutter (1–200, B, T). The document shows the OLYMPUS TOKYO logo and the company name Takachiho Kōgaku Kōgyō K.K., with the address of the Shibuya headquarters. The photograph of the camera is the same as in the brochure published c.1940, and shows an old Olympus Six II with Koho shutter and two-eared aperture index. The last advertisements for the Olympus Six are in the May to July 1948 issues of Ars Camera. The text of the May and June advertisements is similar to that dated January, and describes the Olympus Six, with Zuiko f/3.5 lens and Koho shutter (1–200, B, T). However, the picture shows an Olympus Chrome Six I with Wester N.S.D. shutter. In the document dated June, the top part of the photograph was drawn over with a pencil or a brush, certainly because the camera's top plate was not enough visible in the white background, due to the poor print quality. Body numbers for postwar cameras run from c.13000 to c.18000, and lens numbers from 20000 to c.33000. This makes for a total of about 5,000 Olympus Six cameras and 13,000 Zuiko lenses assembled between early 1946 and the release of the Olympus Chrome Six in 1948. This is quite consistent with the total of 1,015 cameras quoted for the period between January and July 1946 (see above). The offset between the lens and body numbers gradually widened, because Zuiko lenses were sold to other companies, mostly Mamiya for the Mamiya Six. It is sometimes said say that all postwar examples were assembled from spare bodies, and that the production of body shells was not resumed before the Olympus Chrome Six. However this would mean that the company's wartime stocks contained about 5,000 Olympus Six bodies, a figure which seems unrealistic. It is plausible that the production of new bodies restarted at some point, certainly before the camera was modified by the removal of the strap lugs, but nothing is confirmed for sure. ↑ Date: see the documents presented below. This date is also given in this page of the Olympus official website (archived). Some sources say that the Olympus Six was released in 1939 but this is a mistake. ↑ Four elements: advertisements dated December 1940 and April 1941 reproduced in Hibi, p.63 of Kurashikku Kamera Senka no.8. (The December 1940 advertisement is also reproduced in Kokusan kamera no rekishi, p.63.) See also this advertisement dated 1942 or later, reproduced in Nostalgic Camera by Toshio Inamura, and the "Kokusan shashinki no genjōchōsa" ("Inquiry into Japanese cameras"), lens items Lb40 and Lc29. The Zuiko f/3.5 lens is said to have five elements in Francesch, p.60, and in this page by J. Foster at Biofos, but this is a mistake. ↑ Sakurai Eiichi, p.372 of Shashin Kōgyō no.78. ↑ Kokusan kamera no rekishi, p.335. ↑ Advertisement reproduced in Kokusan kamera no rekishi, p.62, and in Hibi, p.63 of Kurashikku Kamera Senka no.8. ↑ Advertisement in Asahi Camera December 1940, reproduced in Hibi, p.63 of Kurashikku Kamera Senka no.8, and in Kokusan kamera no rekishi, p.63. — Advertisement in Asahi Camera April 1941, p.614, reproduced in this article and in Hibi, p.63 of Kurashikku Kamera Senka no.8. — See also this advertisement dated 1942 or later, reproduced in Nostalgic Camera by Toshio Inamura. ↑ Hibi, p.64 of Kurashikku Kamera Senka no.8. See also this page and this page of the Olympus Photo Club website, certainly after Hibi. ↑ Column in Asahi Camera April 1941, p.619. ↑ 11.0 11.1 Brochure for the Olympus Six (part 1 and part 2), reproduced in the medium format page of the Olympus official website (archived). ↑ "Kokusan shashinki no kōtei kakaku", type 4, sections 5B and 6B. ↑ Examples with two-eared index (f/4.5 lens no.7157 and 9917 and f/3.5 lens no.7382 and 10626) pictured in Sugiyama, item 1216, and observed in online auctions. ↑ Examples with pin-shaped index (f/3.5 lens no.7601, 7659, 10727), pictured in Hibi, p.65 of Kurashikku Kamera Senka no.8, in Francesch, p.60, in McKeown, p.747, in this page of the Olympus official website (archived), and observed in an online auction. ↑ 18.0 18.1 Hagiya, p.15 of Kurashikku Kamera Senka no.20. ↑ "Kokusan shashinki no genjōchōsa" ("Inquiry into Japanese cameras"), items 29–30 and 86–7, lens items Lb40, Lb41, Lc29 and Lc30, shutter item 24-P-4. ↑ Advertisement on p.4 of Nihon Shashin Kōgyō Tsūshin, February 15, 1944, reproduced on p.68 of Hyaku-gō goto jūkai no kiroku. ↑ Hibi, p.64 of Kurashikku Kamera Senka no.8, says that the price was ¥208 with f/4.5 lens and ¥248.80 with f/3.5 lens, probably because of a confusion between the numerals 3 and 8. He also gives May 1943 as the release date, but the Super Olympus already appears in the April 1943 inquiry. Foster says in this page at Biofos that the Super Olympus was released in 1945, but this is a mistake. ↑ Example with lens no.12126 pictured in Hagiya, p.15 of Kurashikku Kamera Senka no.20. — Example with lens no.12162 observed in an online auction. — Example with lens no.12507 (body no.12112) pictured in this article. — Example with lens no.13501 pictured in Hagiya, p.15 of Kurashikku Kamera Senka no.20, and in this page of the Olympus Club website. ↑ Sakai, p.7 of Kurashikku Kamera Senka no.20, Hagiya, p.15 of the same magazine. ↑ Blueprint reproduced in the medium format page of the Olympus official website (archived). Air raid destroying the Hatagaya plant: Francesch, pp.27–8. ↑ Nihon no kamera tanjō kara konnichi made, pp.32 and 34; Lewis, p.60. ↑ Examples pictured in this article, in Fujishima, p.23 of Kurashikku Kamera Senka no.8, and observed in a private collection. ↑ Lewis, p.64. Same information in Sakai, p.7 of Kurashikku Kamera Senka no.20, not explicitly mentioning Mamiya. ↑ Examples pictured in this article, in Fujishima, p.23 of Kurashikku Kamera Senka no.8, in this page of the Italian Wikipedia, observed in online auctions, camera fairs or private collections. ↑ Examples pictured in this article, in Sugiyama, item 1217, and observed in online auctions. The camera pictured in Sugiyama is wrongly dated 1940 and classified among prewar and wartime cameras. Foster also says in this page at Biofos that this version of the Olympus Six was sold in 1940, but this is a mistake. ↑ The Fujimoto company was no longer active between 1945 and 1950. ↑ The example pictured in Sugiyama, item 1370, has this type of shutter. ↑ Example observed in this page of a Chinese website (archived). ↑ Examples observed in online auctions. ↑ Example pictured in Francesch, p.61, in McKeown, p.748, in Sugiyama, item 1371, in Hagiya, p.15 of Kurashikku Kamera Senka no.20, in this page and this page of the Olympus Photo Club website. ↑ Special font: examples pictured in this article and observed in online auctions. — Traditional font: example pictured here and here in the Chromesix website. ↑ Examples pictured in this article, in here and here at Chromesix, and observed in online auctions. ↑ See Olympus Chrome Six. ↑ Advertisement reproduced in Kokusan kamera no rekishi, p.125, and in Hibi, p.64 of Kurashikku Kamera Senka no.8. ↑ Compare with the brochure reproduced here and here in the Olympus official website. ↑ Advertisement in Ars Camera May 1948, p.20, and advertisement reproduced in Kokusan kamera no rekishi, p.125. ↑ Kokusan kamera no rekishi, p.348, describes the camera as a version of the Olympus Six with tubular finder and accessory shoe, but this is clearly a Chrome Six. ↑ Hagiya, p.15 of Kurashikku Kamera Senka no.20. Asahi Camera. Advertisement by Ataka Shōkai and Takachiho Seisakusho in April 1941, p.614. Asahi Camera. "Shashin-kai topikku: kokusan zairyō" (写真界トピック・国産材料, Topics of the photographic world: Japanese products), April 1941, p.619. Brochure by Takachiho Seisakusho (company name not indicated). Orinpasu Six (オリンパスSix, "Olympus Six"), date c.1940–1. Document reproduced (part 1 and part 2) in the medium format page of the Olympus official website. "Kokusan shashinki no genjōchōsa" (国産写真機ノ現状調査, Inquiry into Japanese cameras), listing Japanese camera production as of April 1943. Reproduced in Supuringu kamera de ikou: Zen 69 kishu no shōkai to tsukaikata (スプリングカメラでいこう: 全69機種の紹介と使い方, Let's try spring cameras: Presentation and use of 69 machines). Tokyo: Shashinkogyo Syuppan-sha, 2004. ISBN 4-87956-072-3. Pp.180–7. Items 29–30 and 86–7. "Kokusan shashinki no kōtei kakaku" (国産写真機の公定価格, Set prices of the Japanese cameras), listing Japanese camera production as of October 25, 1940 and setting the retail prices from December 10, 1940. Published in Asahi Camera January 1941 and reproduced in Shōwa 10—40nen kōkoku ni miru kokusan kamera no rekishi (昭和10〜40年広告にみる国産カメラの歴史, Japanese camera history as seen in advertisements, 1935—1965). Tokyo: Asahi Shinbunsha, 1994. ISBN 4-02-330312-7. Pp.108—9. Type 4, sections 5B and 6B. Nihon Shashin Kōgyō Tsūshin (日本写真興業通信). Hyaku-gō goto jūkai no kiroku (百号ごと十回の記録, Ten records, every hundred issues). Tokyo: Nihon Shashin Kōgyō Tsūshin Sha (日本写真興業通信社), 1967. No ISBN number. Advertisement on p.68, corresponding to p.4 of the February 15, 1944 issue. Asahi Camera (アサヒカメラ) editorial staff. Shōwa 10–40nen kōkoku ni miru kokusan kamera no rekishi (昭和10–40年広告にみる国産カメラの歴史, Japanese camera history as seen in advertisements, 1935–1965). Tokyo: Asahi Shinbunsha, 1994. ISBN 4-02-330312-7. Items 39–40 and 440–1. Francesch, Dominique and Jean-Paul. Histoire de l'appareil photographique Olympus de 1936 à 1983. Paris: Dessain et Tolra, 1985. ISBN 2-249-27679-X. Pp.26–9 and 59–61. Fujishima Kōichi (藤島広一). "Shattā ni yoru nendai shibetsu" (シャッターによる年代識別, Dating a camera from its shutter). Kamera Rebyū: Kurashikku Kamera Senka (カメラレビュー クラシックカメラ専科) / Camera Review: All about Historical Cameras no.8, September 1986. No ISBN number. Supuringu kamera (スプリングカメラ, special issue on spring cameras). Pp.21–4. Hagiya Takeshi (萩谷剛). "Orinpasu kamera no subete 1: supuringu kamera <senzen-hen>" (オリンパスカメラのすべて1・スプリングカメラ戦前編, "All of Olympus cameras 1: folding cameras [prewar]"). Kamera Rebyū: Kurashikku Kamera Senka (カメラレビュー クラシックカメラ専科) / Camera Review: All about Historical Cameras no. 20, 25 March 1992. No ISBN number. Orinpasu no subete (オリンパスのすべて, special issue on Olympus). Pp.13–5. Lewis, Gordon, ed. The History of the Japanese Camera. Rochester, N.Y.: George Eastman House, International Museum of Photography & Film, 1991. ISBN 0-935398-17-1 (paper), 0-935398-16-3 (hard). P.60. McKeown, James M. and Joan C. McKeown's Price Guide to Antique and Classic Cameras, 12th Edition, 2005-2006. USA, Centennial Photo Service, 2004. ISBN 0-931838-40-1 (hardcover). ISBN 0-931838-41-X (softcover). Pp.747–8. Nihon no kamera tanjō kara konnichi made. (日本のカメラ誕生から今日まで, Japanese cameras, from the birth to nowadays). Tokyo: JCII Camera Museum, 1989. (Exhibition catalogue, no ISBN number.) Pp.32 and 34. Sakurai Eiichi (桜井栄一). "Orinpasu kamera no rekishi" (オリンパスカメラの歴史, "Brief History of Olympus cameras"). Shashin Kōgyō no.78 (October 1958). Pp.371–5. Sugiyama, Kōichi (杉山浩一); Naoi, Hiroaki (直井浩明); Bullock, John R. The Collector's Guide to Japanese Cameras. 国産カメラ図鑑 (Kokusan kamera zukan). Tokyo: Asahi Sonorama, 1985. ISBN 4-257-03187-5. Items 1216–7 and 1370–1. This page was last edited on 8 December 2017, at 11:36.